If a romantic comedy (romcom) film makes you laugh, feel love and inspires you to just live and love freely instantly after leaving the cinema seats – then I guess it has done a good job. But if it makes you feel that you want to watch it over and over again – then, it must be the direk JUN ROBLES LANA magic again. 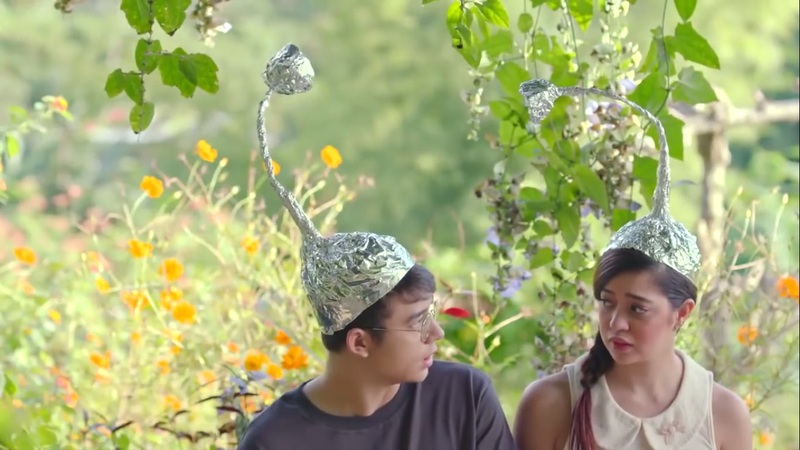 ANG BABAENG ALLERGIC SA WIFI takes you on a non-stop romantic flight that is filled with LOL moments, a couple of socio-political inserts, lots of freshly baked hugots, beautiful landscapes, heart-breaking scenes and pure L-O-V-E.
It’s an exciting time to be a movie fan here in the Philippines! The movie stars Sue Ramirez (Just The Way You Are), Jameson Blake (2 Cool E Be 4gotten) and Markus Paterson – who all gave stunning and believable performances. Norma (Sue) is an ordinary teenage girl, and like most girls today, her life (and love life) revolves around gadgets and technology. One day seh was diagnosed with EHS or Electromagnetic Hyper-Sensitivity – a rare illness that makes her literally allergic to wi-fi or data signals. Forced to live with her grandma (Boots Anson Roa) in a province to recuperate, she was cut off from everything even her boyfriend Leo (Markus) but gains friendship with Markus’ brother Aries (Jameson) and Macha (Angellie Nicholle Sanoy) as well as a better appreciation of the simplicity of life – and love. ANG BABAENG ALLERGIC SA WIFI also stars Yayo Aguila, Candy Pangilinan, Adrianna So, Kiko Matos, Lee O’Brian, and John Lapus. Without giving too much of the story, I’d say that this movie is more of a heart-breaker than a feel good type of film. But just like in life, LOVE is rarely a bed of roses but TRUE LOVE is explicitly described here in this movie as something that you show, express and even make sacrifices for. The distinction between the different types of love is made clear in this movie and that’s why I think that this story, although masqueraded in youthful glow is “very” intelligently well-written. Sue is very lovely in this movie and so is Jameson – acting was so spot-on! But what I did enjoy very much here is the character of Angellie Sanoy – Macha, who is the unbelievably loyal BFF of Aries. She is more than just a comic relief in the film – she’s like the adhesive that binds all the characters altogether. I can’t imagine what the story would be like without her in it. And her acting – impeccable! She could actually win an award for this. 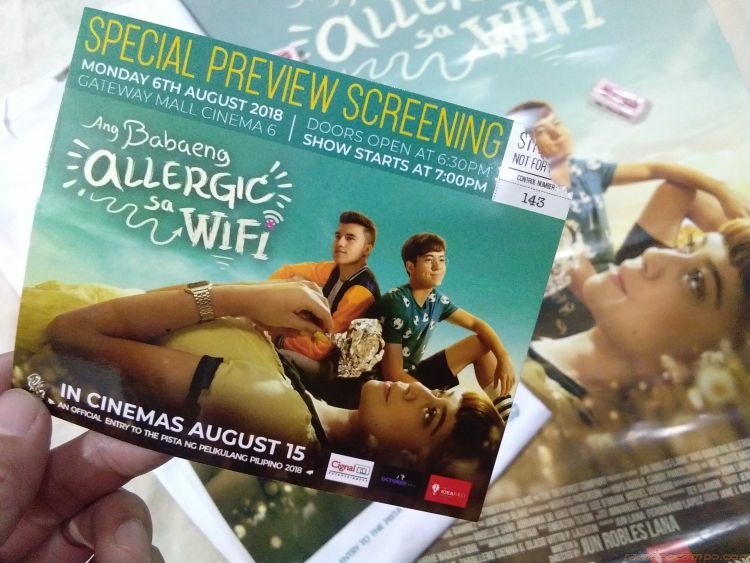 Produced by The IdeaFirst Company, Octobertrain Films and Cignal Entertainment, ANG BABAENG ALLERGIC SA WIFI will be an entry to the Pista Ng Pelikulang Pilipino 2018 which will run from August 15-21. My congratulations to Direk Jun Lana, the cast, staff and producers – this is a very wonderful film.